Peace can only be achieved by working face-to-face with communities and ensuring equal opportunities for them to thrive, no matter where they come from and how long they have been in conflicts. Contributing to opening new paths of dialogue, understanding and reconciliation are also essential, along with the willingness to transform realities for the better. 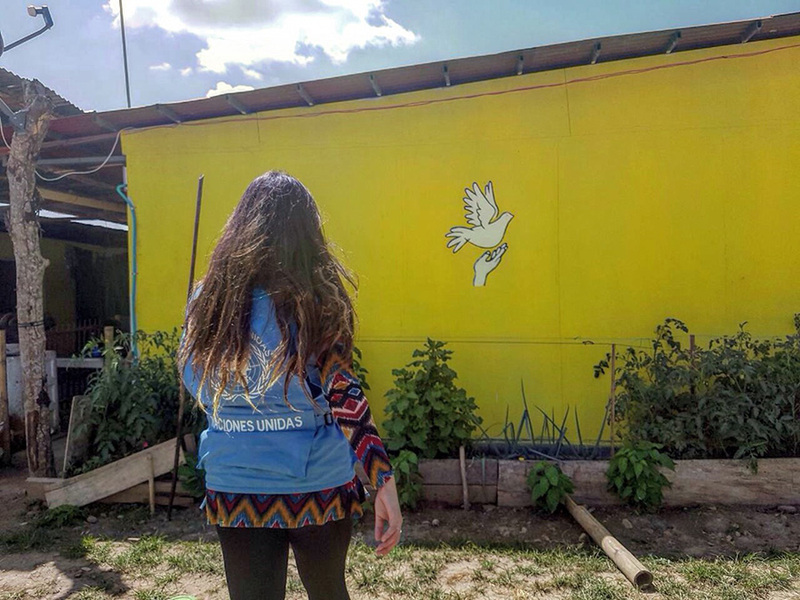 This is something I have reaffirmed as a UN Volunteer in Colombia: people are desperately looking for change. A change that allows them to overcome years of war, and enhance their wellbeing. UN Volunteer and UN Online Volunteer, Karol Alejandra Arámbula Carrillo (Mexico) serving as a Field Officer in the Territorial Space for Training and Reincorporation (ETCR) Filipinas in Arauca, Colombia. Two years ago, the 2030 Agenda for Sustainable Development shaped a roadmap to promote peaceful and inclusive societies, provide access to justice for all and build effective, accountable and inclusive institutions at all levels, therefore recognizing the intrinsic link between peace and sustainable development. Having had the opportunity to lead and work on several development initiatives in my native country and across the globe, as well as witnessing communities’ actions to achieve the Sustainable Development Goals (SDGs), I have also been able to conclude: peace is the first essential step to secure sustainable and healthy societies. Too often, armed violence and insecurity have destructive impacts on a country’s development, just like the case of Colombia for the last five decades. These impacts affect economic growth and result in long-standing grievances among communities. Violence, in all its forms, has pervasive consequences on societies, especially those already vulnerable. It destroys our environment and affects people’s health, development and well-being, and their ability to thrive. Conflicts cause trauma and weaken social inclusion. Lack of access to justice means that conflicts and violence remain unresolved and people cannot obtain protection and redress. Institutions that do not function according to legitimate laws are prone to arbitrariness and abuse of power, and less capable of delivering public services to everyone. As UN Volunteers we get to experience these realities every day, making our job on the ground an important moral and operational responsibility. Combining cultural contexts, where people have lived in violence for decades, with new peace approaches, is quite challenging. But these challenges also represent an opportunity for us to find creative and permanent ways to make sure that the promise we made in 2015 is a reality by 2030 (and earlier!). A few months ago, I came to serve as UNV Field Officer in the UN Verification Mission in Colombia established by Resolution 2366 (2017) of the UN Security Council to verify implementation by the Government of Colombia and FARC-EP of sections 3.2 and 3.4 of the Final Agreement on the Bilateral and Definitive Ceasefire and Cessation of Hostilities and Laying Down of Arms. This includes verifying the political, economic and social reintegration of FARC-EP and the implementation of personal and collective security guarantees and of comprehensive programmes on security and protection measures for communities and organizations in the territories, as well as carrying out the required regional and local verification. I was assigned to follow-up with this process in the Department of Arauca, in the Northern part of Colombia, close to the border with Venezuela. I develop my activities in the Territorial Space for Training and Reincorporation (ETCR) in Filipinas, which is home to hundreds of former combatants who came thanks to the Peace Process, as well as communities who have lived there for decades. I am extremely humbled and honoured to be facilitating this historic process in the region, which I hope will be an important precedent for the region and the world. As UN Volunteers we get to interact with all stakeholders on the ground, from military personnel to local communities, government authorities and former combatants. This has allowed me to identify that despite changing perspectives this continues to be a country that aspires for peaceful communities and equal opportunities for all. Violence is often the product of poverty and abandonment, which is why we must ensure that everyone gets a chance in life in economic, social, cultural and political scenarios. At the end of the day, our verification work and our presence here, with all its challenges, is contributing to ensuring that the communities in Colombia are capable of maintaining peace. There is genuine solidarity and countless people are trying to bring about change. I am extremely humbled and honoured to be facilitating this historic process in the region, which I hope will be an important precedent for the region and the world. Karol holds a Bachelor’s Degree in International Relations and a Master’s Degree in Human Rights and Peace Studies from ITESO University. Karol founded MY World Mexico, an initiative of the UN SDG Action Campaign aimed to engage stakeholders and individuals in SDG implementation through direct people’s engagement, which today has an operative team of over 200 people across Mexico. Karol has also served as Civil Society Representative to the UN in more than 50 high-level events and advocacy processes in at least 10 countries. Karol was one of the few Latin American women and the only Mexican to have been chosen to participate in the adoption of the 2030 Agenda for Sustainable Development during the UN’s Sustainable Development Summit in September 2015. Her team was awarded with the People’s Voices Challenge Award for Best Multi-stakeholder Collaboration for leading a consultation of nearly half a million participants in the definition of the SDGs though MY World 2015. Karol has also been a UN Online Volunteer since 2010.